The actress-singer signed a contract with record label PolyEast Records yesterday afternoon, February 15, at the Universal Tower along Quezon Avenue, Quezon City. 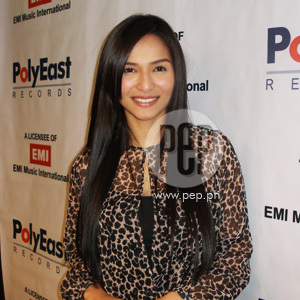 Jennylyn is pleased and agog to start working on her album under the said recording company. She is supposed to produce one album this year. "So dito, parang mas challenging and mas exciting kasi iba yung concept 'tapos iba yung attack nila," relays Jennelyn, whose previous three-year contract with Viva Records ended in 2011. Jennylyn places her faith in this new affiliate of hers, trusting that her singing career will see the same fate as RnB princess Kyla, a successful talent of PolyEast. "So, ang dami nilang mga talent, mga artist na talagang very successful like Zia [Quizon]... sobrang fan na niya ako!" "Sa 'kin that's very important lalo na sa mga kababaihan ngayon. Sa generation ngayon, ang dami-daming mga nangyayari. "So, mas maganda na rin siguro sa mga kababaihan na matuto ng konting-konti or basic lang na self-defense for women. That's very important," tells Jennylyn. The singer-actress also says she is also open to helping out in advocacies that advance women empowerment should it entrust her to teach the fundamentals of self-defense. The 24-year-old also engages in diving almost every week since last year. It was real-life boyfriend Luis Manzano who got her hooked to scuba diving. On Tuesday, Valentine's day, Jennylyn and Luis in fact celebrated underwater somewhere in Batangas City. "So, pagdating ng Tuesday, nandun na kami. Kasi ayaw na namin maabutan... Di ba 'pag Valentine's Day napaka-traffic, punong-puno yung lahat ng restaurants? She further recounts the back story of how Luis introduced her to the newfound hobby. "Nagpunta kami ng Eskaya [Resort], 'tapos pinilit niya akong mag-discovery diving, e, ayoko! Hindi ako nakikinig, yung ganun. "Sabi niya, 'Sige, dadalhin ka na lang namin kahit 'wag ka na sumipa diyan!' Hinihila-hila lang nila ako. "Hanggang sa nagkaro'n ako ng license, 'tapos naging certified diver ako. Dun na nag-start." Scuba diving caused Jennylyn to revel at the beauty of the deep. She tells of her newfound appreciation for the environment. "Kasi hindi mo siya puwedeng basta-basta, 'Wait, puwede ko ba itong hawakan? Baka mamaya may venom ito!' Ganun. "Kailangan mo rin pag-aralan yung mga creatures kasi 'pag nadaanan mo or natusok ka, baka magkar'on ka ng infection. "So, pinagbabasa niya ako ng mga books, 'Ito marami niyan dito' ganyan-ganyan." How does she manage to be a mother to son Alex Jazz, despite the time-consuming demands of her career? The three-year-old toddler is Jennylyn's child with former boyfriend Patrick Garcia. At the contract signing, Jazz, who turns four come August, was with Mommy Jennylyn. "Except yung mga taping days kasi 24 hours yun, magulo yung set. Ayoko siya isama sa mga ganun. "Kahit papaano siyempre, gusto ko rin magkaro'n ng time para sa kanya. "Sa [Jiu-Jitsu] training ko, sinasama ko 'yan. Meron lang 'yang knee pads, elbow pads, saka helmet para anytime na kahit tumambling-tumbling siya dun, 'di siya madidisgrasya." Jennylyn adds that one of her trainers in class happens to be former boyfriend Patrick's brother. The actress neither flinches nor seems bothered by the mention of her ex-lover. If anything, Jennylyn has learned to keep calm and composed under all circumstances, even the most crucial ones. At the moment, however, everything seems to be in place in her life. What lesson has the toughest life experiences taught her? "Para sa akin siguro... kasi sobra ako magmahal [dati], e.
"Kasi lahat... kumbaga parang lahat binibigay ko, e. Parang walang natitira sa akin, sa family ko, sa trabaho ko. She goes on to enumerate them: "Number one yung family. Number two yung career. Number three, of course, yung sarili ko." 'Dati kasi hindi ako magte-taping kasi nag-away kami. Ngayon, hindi na." Prodded to confirm if she sees this current relationship with Luis to last this time, she quips, "Let's see... Basta ngayon alam ko na yung priorities ko."